In an effort to, I don’t know, better myself? Become more cultured? Step outside of my comfort zone? I signed up to take an art class of sorts a couple of weeks ago. One of my friends teaches her methods for art journaling once a month at Turnip Green Creative Reuse and I’ve always liked her stuff. Plus, I keep hoping there is some latent creative gene in me that will eventually surface because everyone in my family seems to have a talent for creating things and I, thus far, got bupkis. The point of the art class exercise was to create a collage layout, and I think the focus was supposed to be a face but being as how I was exposed to pretty paint colors and flowers and hearts and rainbows, I stopped listening the moment Michelle said, “Pick out some things from the table over there that speak to you.” I had a fistful of greeting cards and heart stencils that I placed in my spot and then went back for some scrapbook paper and calendar pages. When I had a tidy little pile of stuff that appealed to me, I took the handful of faces Michelle had ripped from magazines and passed around the table and then handed the intact pile to the next girl. Michelle then explained that we would attach our selected faces to our pages and here I began to understand that there was the distinct possibility that I had not listened. I’m a rule follower almost always but apparently when it comes to speeding laws and art projects, I am not. Still, I began, like everyone else, cutting out phrases and flowers, painting some with a wash here and ripping pages into circles there. I fought with myself for a while over placement and color, knowing that matchy-matchy, my favorite kind of art, was not the goal. I earnestly worked on my piece for a couple of hours. I got paint on my shorts and under my nails. I smelled like glue and glitter. It was fantastic! As I worked, I kept my eye on the ladies around me creating their own pages. These women were far more artist-y than I, and they kept using expressions like, “Oh, the juxtaposition of the emotion and the light here is what I’m trying to capture,” and “The energy of this color pattern is rejuvenating.” Since my artist-y expressions skew more towards, “ooh, pretty!” I felt slightly underqualified and a little jealous. Kelly, the proprietor of Turnip Green, began making the rounds towards the end of the class to check out our work. I glanced at the woman on my left and eyeballed her collage. To my untrained eye, it looked a bit like she tipped over the paper recycle bin on to her pages and then glued everything onto the exact spot upon which it fell. I then glanced at the woman on my right and eyeballed her collage. 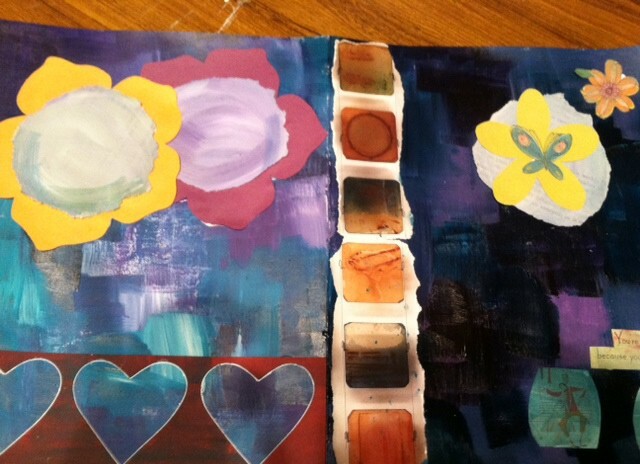 She used a lot of dark color and threw it all together on her page in a mishmash. It was appealing but I had no idea why. I took a peek at Michelle’s page and then realized that I had missed the mark completely. Lest you doubt me, and lest you want to say, “Art is subjective, Jimmie. It belongs to the artist and says only what the artist wants it to say,” I’d like for you to hear Kelly’s comments. To the woman on my left she said, “I like very much how you’ve broken this up into sections. You clearly have growth over here and fallow over there. 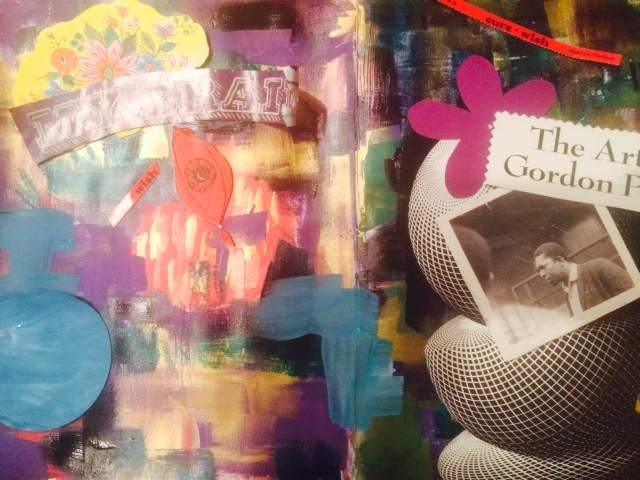 I love the energy in that.” This was the recycle bin collage. I didn’t get it. To the woman on my right she said, “The flow here is perfect! What a fantastic use of color and theme!” I was drawn to it but why?! I didn’t get it! To me she simply said, “It’s so pretty.” That I got. And that also explains why I will never be an artist. And check out Michelle’s work at Studio B.
JIMMIE…..”Art IS Subjective!” and the artist does own it. It’s what flows from within you. Trust me! Many times, I’ve started out painting one thing and it ended up as another. Art comes from emotion and passion, is my belief. Apples to Apples….never compare yourself to someone else, as each of you have your own experiences. Perhaps the other two artists have a more seasoned background in expressing their intent on the pages. Patience and time generally hones the creative process. Picasso didn’t become Picasso overnight. He too, had to hone his creativity. Keep it up, you will be surprised with what you accomplish. Be passionate about your creative instincts. THank you, Felix! I’m going again to take the class. I’ll learn and try new things. I may hate it but I also may love it. How will I know unless I try?